It’s all in the details, of course, and nothing is spared in our superior construction. This ensures your draperies will measure up to the highest standards of tailoring. All our pleated drapes consist of three layers – a lining, an interlining, and the fabric of your choice. Our non-pleated (rod-pocket) drapery designs consist of two layers – lining and the fabric of your choice. As a two-generation curtain store that is family owned and operated we are able to professionally answer all of your custom drapes and design questions, provide our tasteful and cost-effective recommendations, and get to work on building your new set of fabric curtains. We have a network that includes some of the most revered American Curtain Designers which happen to be located right here in Texas. 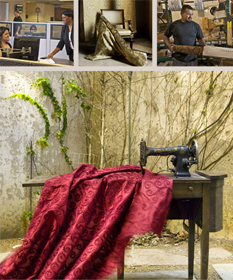 Our relationship with these renowned curtain-makers and them being local helps you save time and money. Many companies who offer this level of pricing rarely run special discounts or promotions, but we’re not like many companies. Getting you the best price for your new draperies and seeing how much you love them is what makes us happy, curtains are our passion, and we love to share our passion by offering seasonal drapery design patterns and unique curtain fabrics at the lowest clearance pricing. You won’t believe the level of quality you are receiving when it comes to the drapes or our comprehensive services. Few curtain companies in the industry carry as many drapery styles and curtain fabrics as we do. There is a lot more to operating a professional drapery company than having a large inventory though. Over the years we have fine-tuned our approach and are able to provide complete interior curtain design services in a variety of ways. 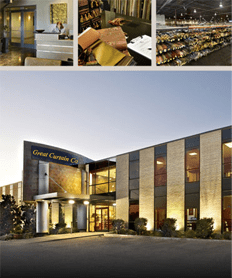 If you are not located in Austin and are in the Round Rock, Bee Cave, or Buda, Texas areas and aren’t able to come to our store conveniently, you can receive our same great service by contacting us for an in-house consultation, or work with us virtually. If you have a smartphone, camera phone, or webcam, you can normally work with us from the comfort of your home and we’ll handle the rest. This level of diversity and personalized service has made us the go-to option for any property in Austin or any of the surrounding communities. We want to make working with us not only a positive experience for you during your design project of any scale. On top of our exceptional selection and handpicked personalized service available in our shop, at your home, or online, we also strive to make all of it as affordable as possible. Not only do we work with you to make sure your drapery design, valances, or custom bedding matches your room’s style, The Great Curtain Company provides you with the highest level of quality that fits every budget. 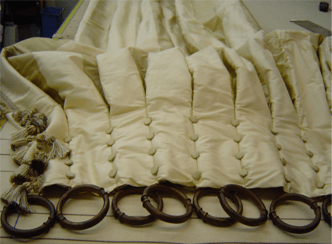 To make sure every set of drapes that leaves our shop meets these quality standards, each pair of curtains made undergoes rigorous inspections to test for durability, aesthetic soundness, and many other physical and visible attributes. Being your one-stop-curtain-shop not only are handmade custom drapes available, you can also find blackout, acoustic, and European style interlinings to compliment the style of your new curtains as well as the functionality of each room. Learn more about the styles of draperies that are offered at The Great Curtain Company, please give us a call, or schedule the consultation that fits your schedule and needs most. Become a part of our family today. Trust us for all of your pleat drapery design, valances installations, custom bedding services, curtain hardware solutions or any of our other window treatments. Our fabrics include a wide selection of first run quality beautiful silks, blends, cotton and linens that are constantly updated with fresh patterns and colors. Our lining – which provides light protection, insulation and a luxurious feel – is 100% cotton, so you’ll notice a softer drape than with blended linings. The lining comes in many colors of your choice. Our interlining with finished edges, is also 100% cotton so that it’s more luxurious than heavy flannel but not as bulky as “bump” linings. The ultimate luxury for European styling and added insulation. Our new Blackout lining option is the ultimate in light and temperature control. Acoustic linings are available for media rooms, loft areas, and street facing windows. Every pair of curtains or custom order passes a rigorous inspection team before shipping out to you to insure the highest standards in our industry.